The WANALYZER_SCROLLBARS_SETTINGS structure describes settings applied while rendering the scrollbars on the Waveform Analyzer. The current settings can be retrieved through the WaveformAnalyzer.SettingsScrollbarsGet method and modified through the WaveformAnalyzer.SettingsScrollbarsSet method. This data structure is defined inside the AdjMmsEngDef.h header file which can be found inside the product's Include directory (default C:\Program Files\Active Sound Recorder\include). This data structure is defined inside the AsrecDef.bas module file which can be found inside the product's Include directory (default C:\Program Files\Active Sound Recorder\include). Height of the scrollbars in pixels. By default this value is set to 12. If the nType field below is set to WSCROLLBAR_TYPE_RECT, this field cannot be set to a value smaller than 6. If the nType field below is set to WSCROLLBAR_TYPE_WAVEFORM, this field cannot be set to a value smaller than 12. Eventual smaller values will be automatically capped to the nearest valid value. Determines how the scrollbar is visualized. Scrollbars display a small sized representation of the full waveform with absolute values. 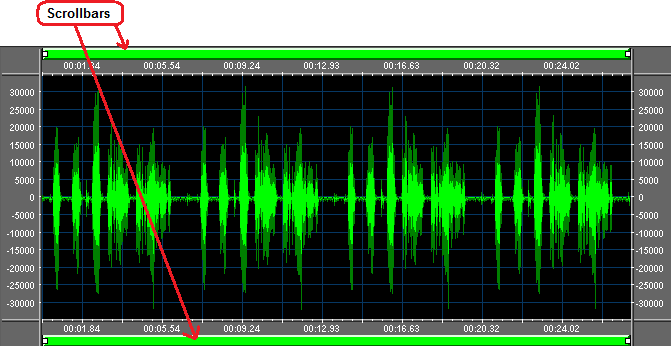 Combination of values determining the mask of graphic items that must be drawn on the waveform scrollbar. Boolean value that specifies if the top scrollbar is visible. Color used for rendering the scrollbars background. Color used for rendering the scrollbars thumb. Color used for rendering inside the scrollbars the waveform background for visible range. This setting is ignored when the nType field above is set to a value different from WSCROLLBAR_TYPE_WAVEFORM. Determines how the visible range of the waveform is displayed. Displays a transparent glass over portions of waveform representing ranges of the waveform outside of the visible area. Transparent factor applied to the transparent glass. This value can range from 0 (total opacity) to 255 (total transparency) with a default value of 128. Values outside of this range will be automatically capped to the nearest valid value. This setting is ignored when the nVisibleRangeType field above is set to a value different from SCROLL_WAVE_VISIBLE_TRANSP_GLASS_INNER or SCROLL_WAVE_VISIBLE_TRANSP_GLASS_OUTER. Width of lines in pixels. Cannot assume values smaller than 1. The default value is 2. This setting is ignored when the nVisibleRangeType field above is set to SCROLL_WAVE_VISIBLE_TRANSP_GLASS_INNER or SCROLL_WAVE_VISIBLE_TRANSP_GLASS_OUTER. Boolean value that specifies if scrollbars are enabled during playback. Position of the 3D effect for the transparent glass. This value can range from 0 to 100 with a default value of 50. Values outside of this range will be automatically capped to the nearest valid value. Boolean value that specifies if the transparency of the 3D effect is inverted.